Prof. Tamar Ross responds to the comments. I would like to thank readers for their thoughtful comments. The initial problem I seek to resolve is how to defend the traditional Jewish belief in TMS (Torah min haShamayim), when faced with evidence that appears to contradict it. Beyond the usual difficulties (challenges to the notion of divine authorship on grounds of erroneous content, questionable morality, and a complicated literary genesis which testifies to evolutionary historical development), I am especially troubled by the very notion of divine revelation as verbal communication – given that language is a distinctly human activity, inevitably rooted in a particular perspective and cultural bias. My solution is to regard belief in revelation as an “as if” statement, a useful fiction (or, in Maimondian terminology, a “necessary truth”) whose purpose is to represent and engender certain attitudes rather than to describe an objective occurrence. I see this understanding as closely related to views of religion as commitment to a range of doctrines and norms which serve as a cultural-linguistic filter constructing the way we view the world, rather than as an objective account of reality – metaphysical or otherwise. I think that most believers in the past adopted such an attitude unreflectively, understanding belief in TMS simply as loyalty to the Torah and to the way of life that it propagates, without delving into overmuch detail regarding its doctrinal content. However, when such an attitude is adopted consciously as a blanket response to new loss of innocence, conducting day to day life according to its guidelines could be more problematic. This has driven me to develop a theory of revelation (as unfolding through time and the development of human understanding) and a picture of God (as both immanent and transcendent) that might counteract such difficulties, by conflating the dichotomy between divine reality and human input. In such a view, questions such as that of Joebug (“why would God structure aII world with ongoing revelation based on an imperfect morality? Why not just start with good ethics to begin with?”) are inappropriate. The whole picture of God is of process, rather than personalist, so that questions of intent and motive are out of place, except when speaking on a certain level of mitzidenu. As I see it, the main critique of my position, expressed by a variety of posters, is that I am trying to dance at too many weddings at once. In the eyes of such critics, I would do far better adopting an approach of bifurcation, as represented by the later Wittgenstein’s language game theory, recognizing that religious discourse has its own rules, and is therefore immune to questions raised by scientific inquiry. The truth of the matter is that I start out with this position. The sub-title of the paper I am writing on the topic (“Orthodoxy and the Challenge of Modern Biblical Criticism”) is: “Some Notes on the Importance of Asking the Right Question”. This is because I begin with the same position as Brian Klug, who – in the wake of the later Wittgenstein – seeks to emphasize that the meaning of belief in a scientific and religious context is not the same. In the first instance, it is a statement based on empiric evidence. In the second, it is a profession of allegiance and commitment. But, as opposed to Evanston Jew’s analogy, I do not see the two realms as separate, self-contained locations speaking different languages, with only high traveling costs as the problem. A more appropriate analogy is a Jewish ghetto, situated alongside other distinctive communities, within a larger municipal framework. Ghetto members speak their own language amongst themselves, but are often called upon to adopt a more universal tongue when engaging with their neighbors. The language of the neighbors also seeps into ghetto territory and infiltrates their native tongue. Because of such overlaps, which intensify considerably in an age of increased mobility and globalization, Evanston Jew’s (and Josh Stadlan’s?) suggestion that we “try to patch together an overriding picture that will clarify our frequently conflicting intuitions” into some form of “reflective equilibrium” simply by adopting different rules of inference for religious and secular worlds can only go so far. (And as an aside to Josh Stadlan: I have no more problem than you do with “suggesting that certain parts of the Bible were originally political polemics, etc.”, and only retroactively appropriated as d’var Hashem, but I would certainly be interested in hearing more of your take on the matter). Another recurring criticism of my views is their impenetrability. I sympathize with objections to use of jargon, and must admit that I found similar difficulty in deciphering the meaning of some of my critics, so I apologize if I have fallen into the same trap. I also realize the limits of an over-sophisticated theology. But although philosophical speculation is not the religious bread and butter of most believers, I do believe that its general thrust is being developed intuitively on the ground, where the true destiny of any theology is really determined. This can be discerned, for example, in an increased interest in mysticism, in the interconnected nature of all that exists, and in a variety of spirituality that is unmediated by reason and more formal institutional structures. In response to Chavrusamatch – my decision whether to interpret revelation, as well as other miraculous events of the exodus literally or metaphorically is one that is determined exclusively by scientific evidence and not by doctrine. This policy is close to that of the medieval rationalists, who – in the words of Maimonides – “try to reconcile the Law and reason, and wherever possible consider all things as of the natural order” – succumbing “only when something is explicitly identified as a miracle, and reinterpretation of it cannot be accommodated” (Ma-amar tehiyat hametim). But I am even more sympathetic with the approach of R. Kook who contends that as the world progresses, what was previously defined as miracle now becomes nature, with new miraculous horizons taking their place, and his rather casual response to the question of limits. When asked just how far non literal interpretations can be extended, he suggests leaving the answer to this question to the “clear sense of the nation” which “finds its paths not in isolated bits of evidence, but in general impressions”. As for objections to the claim that my theological approach relies only on later thinkers, I disagree. True, the allegorical interpretation to the doctrine of Tzimtzum is a recent development from the 17th century onwards, but suggestions regarding the fluid nature of Torah, the subjectivity of human perceptions of God and His word (including that of Moshe Rabbenu), the attunement of Torah to history, and even cognizance of the constructive nature of religious belief, can be traced from Hazal onwards (for more detailed discussion, see chapter 10 of my book: Expanding the Palace of Torah). But I also do not believe that we are utterly bound by precedent in developing new ideas. As I have already stated, reference to Tzimtzum shelo k’peshuto does not mandate acceptance of kabbalistic metaphysics lock, stock and barrel. Issues of realism versus non-realism are a perennial philosophical theme, and have assumed many forms. Nevertheless, the Misnagdic and Hassidic concept of layered levels of consciousness that indicate layered levels of reality is instructive. Questions were raised regarding the repercussions of a cumulative view of revelation on traditional Talmud Torah. I contend that accepting the revelation at Sinai as a foundational myth rather than a historical fact does nothing to diminish its formal role as the foundation for any subsequent interpretive activity. I admit that a cumulative view is more hospitable to innovation, rejecting positivist efforts to establish THE definitive view of Torah on any particular issue. But such open-endedness is still committed to the centrality of the Torah text and to working with the traditional categories and methods of the past, even as these are altered by new contexts. Another serious question raised by a view of revelation as humanly determined (i.e., as dependent upon human recognition rather than a divine bang on the head) is that of criteria – i.e., how do I adjudicate between competing truth claims? Ostensibly, a simple believer can rely on the unequivocal truth of his religious tradition as the direct word of God, whereas I can only appeal to the grip that its picture has upon me and my identity. But I must point out that even the simple believer’s identification of TMS as an inescapable truth is a subjective one that could have been otherwise. The only solution to relativism or subjectivism, as has been suggested, is pragmatic – but a pragmatism that is informed by a willingness to learn from other points of view and to incorporate these, when necessary, into one’s own perspective. In response to SK, I daresay the willingness of most baalei Teshuva to change their pre-Orthodox personal convictions regarding ethical behavior has more to do with an attraction to the Orthodox lifestyle and what it offers than with any purportedly objective argument, and it is this that leads them to view Torah as truth. As I mention previously on this blog, I have in my files almost two years of drafts, or at least outlines, of unfinished blog posts. One of them was on the book by Rabbi David Stav on popular culture, Bein Hazemanim (Yediot Aharonot, 2012). At the time of its publishing, I was working on my Orthodox Forum article on popular culture but it was not germane to my presentation. However, as of late, Rabbi Stav’s views on popular culture have come to a broader audience through the opposition to his allowing Orthodox Jews to see films. Gasp! Bein Hazemanim, released a year ago, frames the question as what to do with one’s leisure time. The goal is to reduce the growing gap between Torah and routine activities of the public. Modern life is characterized by abundance of leisure relative to previous generations, and it is filled with patterns of cultural and entertainment which are not expressed in “genuine” religious literature. How does one relax after work, spend vacations and go for family outing? 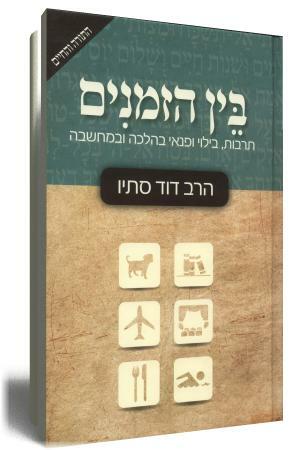 The book was reviewed by all major Israeli papers and as they all noted in unison, that there was a greater promise of offering answers to bigger questions that were not answered such as choosing between going to South America or India after the army, the worlds of art and literature, the role of being a sports fan, or which Mp3’s should be on one’s phone? The Rabbinic approbations treated the very questions of leisure as not ideal (bedieved), only for those who could not live the ideal life, so the content of the book was much less than the promise. The tone was that unless we permit certain things, the dam won’t hold. The opening of the book offers the dichotomy of extremes, either not wasting any time because of bitul Torah as opposed to the Talmudic statement that the recitation of the Shema could serve as one entire obligation to study Torah. Leisure is presented as the down time from Torah study, or more plainly as the human need for relaxation and the human tendency to play. Each chapter offers a form of leisure, such as reading, art, sports, hiking, movies and theater, treated by his collection of Biblical verses and followed by responsa. For example, music is discussed by its genealogy to Yuval in Genesis, music playing in the temple, Simchat, Beit Hashoeva, and then to modern sources. Each topic includes both lenient and strict sources but returns to the original approach, showing recreational and leisure are not improper in themselves. The book concludes with a discussion of tzedakah and volunteering one’s time for chessed. The short review in Ynet (h/t Menachem Mendel) states the Religious Zionist problem with the book in succinct terms. My problem with the book is that […] this ship has sailed long ago. Most of the Religious – National do not looking for permits to see movies or listen to music. In contrast, the ultra-Orthodox community, at least outwardly, does not admit that they consume Western culture, prohibition or permission. Rabbi Stav is rabbi for the Ezra youth movement founded in the spirit of Hirsch’s Torah and Derech Eretz. Rabbi Hirsch did not do these contortions to permit Beethoven, Schiller, and hiking the alps. He had a vision of an integrated culture. More directly: Did anyone in Bnai Akiva seek permission to listen to Shlomo Artzi or to hike the trails of Israel? The review in the Religious Zionist newspaper, Makor Rishon, was a full-fledged rejection of the book as irrelevant religious leadership. The review written by Dr. Roni Shweka, whose PhD is in Talmudic Studies and who is a member of The Friedberg Geniza Project Computerization Unit and author of New Song: Essays on the Formation of Israeli Rock (Carmel, 2011), delivers a manifesto on the role of culture and Religious Zionism. Shweka asks that if a student came to him for guidance on balancing Torah study, his social life, college, and leisure would Rabbi Stav open the case books of law or will talk with the embarrassed boy and try to figure out where his heart tends, where are his qualifications and on what path will he have the most success to himself, the community, his spiritual personality, and his professional future? Most of these questions are about balance, personality formation, maturation. Since the reviewer is left to assume that Rabbi Stav would approach it that way in person, one cannot help but question the minimalist formalism of the book. Rabbi Stav finds Rav Kook innovative because of Kook’s belief that melancholy, ill patients or those with a sad heart could walk occasionally. Shweka in turn asks if any of us seek a responsa for permission to take a long walk. Each form of leisure is shown to contribute to the health and peace of mind through the rest and relaxation needed from time to time. The Sages treated walks favorably. Sweka thinks that this approach reveals a lack of understanding about modern culture, its social contexts, and what roles and needs it fills. Talking a relaxing walk is the paradigm, sports are also relaxing to watch but there is no recognition of the culture of sports its violence or ethos. Literature is relaxing but no discussion of the edifying and cultural role of literature, which is so prevalent in American discussions. Shweka’s review becomes a manifesto when he declares that the book is still written as if it is 1904 when Rav Kook wanted the secular Israeli artist and novelist to become to become part of the holy religious renewal. Rav Kook saw secular literature as heresy, hence the need for orthodox literature. However, today our lives and thoughts are immersed in literature and film. And more importantly, we now recognize that the literary impulse is fundamentally beyond the closed religious world. Even the novels of Agnon, Rav Sabato, or even Emunah Elon are based on the categories of Western aesthetics, the emptying of certainty and dogma, and a personal psychological perspective. Hence, the question of which movies and novels have a positive or negative content does not need rabbis but aesthetic education. The chapters should not have been on leisure activities but on the nature and context of the formation of cultural understanding and aesthetic sophistication (Makor Rishon, 10/08/2012) . Many of the questions related to leisure culture arose only in recent years mainly due to technological development. But Zoldan thinks that Rabbi Stav has brushed away problems by creating new clear lines. If there are problems with modesty, then his solutions are too easy: you can allow the viewing of the film and just close your eyes at the problematic scenes. For Zoldan, Stav’s malicious hand changes the law and threatens to destroy the Jewish tradition.Conversely, Zoldan thinks that there will be those, especially traditional or secular Jews who will welcome this book. But these three book reviews are not where the story ends; popular culture has become the fault line in a much bigger cultural war. In 1997, Rabbi Zvi Tau led a schism in the Merkaz world against the integration of a teachers college that used Western pedagogy and basic geography. Rabbi Tau is completely anti-Western culture and with the return to the land, he believes religious Jews should cease to have any connection to Western culture. He considers Western culture the same as the pagan Amorites that needed to be driven from the land. He thinks we are blinded by west – the same way we were blinded by communism. Rabbi Tau also believes that life is entirely about the collective and the family unit, while individualism is Western showing the West’s selfish, greedy, and cruel nature. Rabbi Stav’s attempt as head of Tzohar at allowing Western culture, leisure, and individualism cuts at the core of Rav Tau’s approach. Much of the opposition to Rabbi Stav comes from the followers of Rabbi Tau as a form of cultural war. At the same time, these followers of Rabbi Tau fear a schism in Religious Zionism if a Chief Rabbi would be in favor of Western culture such as higher education, individualism, and leisure. Such a Chief Rabbi would situates them as the polar opposite of the rabbinate, one side seeking integration with western culture and the other side driving out Western culture. A Merkaz Harav or Haredi Chief Rabbi would keep the broad status quo in Religious Zionism because they would be pragmatic and not be intrinsically in favor or opposed to Western culture. This cultural split between Rabbis Stav and Tau goes back 30 years to when the senior Rabbi Tau asked his students at Merkaz Harav to interfere with the concert where they played Handel’s Messiah. The then 23-year-old Rabbi Stav said this was not the way to act and was not allowed to attend further classes by Rabbi Tau. Currently, the followers of Rabbi Tau inconceivable that a candidate for the chief rabbinate admits to having gone to movies and to having read novels with racy graphic scenes such as the Israeli author Yochi Brandes’ Melakhim III and “haPardes shel Akiva.” On the tension of the students of Rav Tau and Rav Stav- see here And see the discussion at these two blog posts about the tension- Rav Tzair and Minim. Here’s a general interview with Rabbi Stav on other topics. Finally, Rav Ovadiah Yosef, who has publicly opposed and insulted Rabbi Stav, is a big fan of the female Egyptian vocalist Umm Kulthum and permits listening to recordings of female singers; he only forbids the attendance at their live concerts. (Even Bob Dylan thought she was great, really great!) The press cites that he objects entirely to Rabbi Stav’s watching films (and one recent article adds that he objects to Rabbi Stav’s seeing no problem with any and all touching of women when not for affection). Raising the question of how does one adjudicate between radio and cinema. Is it hearing as opposed to seeing? I am less interested in politics and want to return to the cultural questions which our overtaking our era. In America, we have greater use of pop culture even from the pulpit. It fills our lives and serves as Torah for many Orthodox rabbis for whom anything used to serve Torah is OK. The issue will keep coming up and may lead to division in the future. 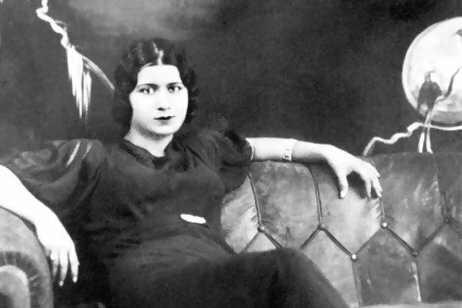 In the meantime, you may want to listen to this wonderful NPR documentary about Umm Kulthum, especially since we do not even know who is Rabbi Stav’s favorite pop singer. Brian Klug is a Senior Research Fellow & Tutor in Philosophy at St. Benet’s Hall, Oxford and a member of the philosophy faculty at Oxford University. Many years ago he attended Hasmonean and after the Jacobs crisis his family switched congregations from the New West End Synagogue to the New London synagogue to follow Jacobs. Is Torah from Heaven like crediting God with the naturalistic production of bread in hamotzei or is it like the miraculous manna? Do we focus on the “from” in the phrase and try and figure out a more naturalistic process of the Divine entering the human, or do we focus on “heaven” and ask what Heaven means in our lives? The Section Heading are not in the Original and were added to aid in mobile reading. But when [Jacobs] avers that “belief in God is entirely reasonable”, I feel as if wires are being crossed. ‘Reasonable’ and ‘belief in God’ are not, for me, phrases that can be uttered in the same breath. If it were a matter of reasonableness, then belief in God would be hostage to ‘the facts’; for what appears reasonable at one time can seem unreasonable at another in the light of new information. It would be like believing that intelligent life exists elsewhere in the universe. Given our current state of knowledge, rational people disagree about this: some find the idea plausible, some think it is ridiculous and some suspend judgment. If one day a space probe discovered a washing machine on another planet, then the question would have to be revisited. And if belief in God were on the same footing it would, as it were, extinguish the fire of belief. (Instead of fire, belief would be like a pair of scales, for reasonableness is about the balance of probabilities.) By the same token, if belief in revelation – in the doctrine of Torah from heaven – is held to be merely ‘reasonable’, then eo ipso it loses its grandeur and does not retain its ‘ancient vigour and power’. I am with Jacobs completely when he says boldly: “We refuse to accept that the only choice before us is the stark one of either rejecting all modern knowledge and scholarship or rejecting belief. We believe that we can have both.” But on what terms? What are the terms of this accommodation? If Torah had this ‘meaning and resonance’ for [Jacobs], it implies that the doctrine retained its grandeur, its ‘ancient vigour and power’, for him too. In which case the question becomes this: Does his own solution to his own conundrum – his reinterpretation of the doctrine – possess these qualities of grandeur, vigour and power? I am not convinced that it can. Not that I speak as a ‘fundamentalist’ – as someone with a ‘pre-scientific attitude’. If [many focus on] on ‘Torah’ and Jacobs on ‘from’, it is ‘heaven’ that catches my ear. What does it mean to attribute a book or text to heaven? What sense does it make? What difference does it make to the status of a piece of writing on earth when we ascribe it to heaven? Of course, to put the question this way is already to have in hand a distinction between heaven and earth. It therefore presupposes another question: How does the word ‘heavenly’ inflect the word ‘earthly’? What does it do to our sense of the mundane when we see the world as sublunary? For suddenly our whole point of view has changed. Wittgenstein touches on this change of point of view when he reflects on the difficulty he has in believing in the resurrection of Christ. “I cannot call him Lord,” he says. Why not? Because, he says, “I do not believe that he will come to judge me; because that says nothing to me”. Then what would it take to enable him to believe in the resurrection? His answer is complex but I shall cut to the quick. “[T]his can only come about,” he says, “if you no longer support yourself on this earth but suspend yourself from heaven. Then everything is changed and it is ‘no wonder’ if you can then do what now you cannot do”. It might seem paradoxical to refer to the resurrection of Christ at a seminar in Jewish Studies and in the context of a discussion of Torah min HaShamayim. But Wittgenstein’s reflection is as good an entrée as I can think of to the body of my paper. For what I would like to suggest, in a similar vein to Wittgenstein, is this: everything is changed when you see Torah not as the product of earth but of heaven. And this is where or why the analogy with hamotzi breaks down. It is one thing for bread to be brought forth from the earth, another for Torah to be given from heaven. The shift of location changes everything; and this change is as great as the difference between a merely reasonable belief and a belief that possesses the grandeur, the vigour and the power required for ‘a basic article of Jewish faith’. What is Belief? What is the Difference between Scientific and Religious Belief? Suppose, for instance, we knew people who foresaw the future; make forecasts for years and years ahead; and they described some sort of a Judgement Day. Queerly enough, even if there were such a thing, and even if it were more convincing than I have described, belief in this happening wouldn’t be at all a religious belief. Similarly, suppose Apple invented an electronic device for ‘post-seeing’ the past, giving access to events that took place years and years ago… And suppose someone using this device sets the dial for the 6th of Sivan in the year 2448 from the day of creation (1313 BCE), seven weeks after the Children of Israel left Egypt. On the monitor of this device, after a degree of crackling that sounds like thunder and looks like lightening, a scene comes into focus of an entire people gathered at the base of a mountain in the wilderness of Sinai. A dark cloud sits on the summit and a booming voice can be heard from on high, enunciating commandments. Strangely enough (Wittgenstein would say), even if there were such a device, and even if the images on the screen were more convincing than I have described, belief in this epiphany – belief that Torah was given from heaven – would not be a religious belief. In this sense of ‘belief’, what Wittgenstein says about Christianity applies equally to Judaism: Christianity is not based on a historical truth, but presents us with a (historical) narrative & says: now believe! But not believe this report with the belief that is appropriate to a historical report, – but rather: believe, through thick & thin & you can do this only as the outcome of a life. Here you have a message! – don’t treat it as you would another historical message! Make a quite different place for it in your life. – There is no paradox about that! By the same token, there is nothing paradoxical about disbelieving the historical claim that the Torah was given to Moses from heaven – what would it even mean to believe this? – and believing it as a point of faith. This is a measure of the difference in meaning between ‘believe’ and ‘believe’ – a difference in the work being done – when the same word is used in these two different contexts. In light of Wittgenstein, we can say that the doctrine of Torah from heaven makes the following demand on us: embrace the idea with a passion – ‘believe, through thick & thin’ – or leave it be, but don’t ask for the evidence. It is not a hypothesis or theory. Which brings me back to the question that I posed in the first section of the paper: What are the terms of accommodation between the demands of Wissenschaft and faith? Jacobs rejects the ‘traditional view’ of the doctrine of Torah from heaven on the grounds that it is “contrary to the facts of history”. His new interpretation is intended to allow for the selfsame facts. But, if we approach this in light of the passage I have just quoted from Wittgenstein, we can say that the trouble with the ‘fundamentalist’ view is that it puts the doctrine in the wrong place. It puts it in the same place as a historical claim. Having done this, it then compounds the felony by refusing to let the doctrine be judged by historical criteria. This is irrational and indefensible: Jacobs is quite right about this. But recall his definition of a fundamentalist in the Jewish context: a “Jew who persists in maintaining a pre-scientific attitude”. This suggests that the fundamental error of the fundamentalist lies in the second false move: rejecting the established criteria for judging claims about history. Whereas, in light of Wittgenstein, we can say that the fundamental error of the fundamentalist lies in the first: putting the doctrine of Torah from heaven into the box called ‘history’. For this is the wrong place for it. The way to correct this error is not to apply historical criteria in reinterpreting the doctrine – Jacobs’ approach – but to make quite a different place for it in the life of the believer. It is tempting (though too glib) to say that the trouble with the ‘traditional view’ is not that it is pre-scientific but that it is not post-scientific. But I did not say that. “The Torah did not simply drop down from heaven” says Jacobs. He adds: “it has had a history.”What I feel about this statement is that it is a hybrid, a kind of conceptual shatnez (a garment woven from wool and linen (Deut. 22:11)). No doubt, the text of the book or books that we call ‘the Torah’ has been written over time (though the precise story of their writing is a matter of scholarly dispute). But viewed as the word of God, the Torah is eternal and cannot have a history. As I mentioned at the beginning of the paper, Jacobs recognises that “the traditional picture”, in which the Torah did, more or less, drop from heaven into Moses’ lap, “has grandeur and power”. But he thinks it has to go. But does it? “What am I believing in when I believe that men have souls?” asks Wittgenstein in the Investigations. There is, he says, “a picture in the foreground, but the sense lies far in the background; that is, the application of the picture is not easy to survey” (par. 422). He does not take issue with the picture per se; the issue he raises is about its sense, its use. As he remarks two paragraphs later: “The picture is there; and I do not dispute its correctness. But what is its application?” (par. 424). When I read Jacobs, when I consider his trenchant critique of the position that he calls fundamentalist, the position that digs its heels in when confronted with ‘the facts of history’, I find that this is the question that arises for me. Not: Is the picture (the traditional picture of Torah given from on high) correct? But: What is its application? This means: How does it manifest itself in the life of the believer? For it is there, in the fray of life, that it gets its sense. And there might not be any other way of expressing what it expresses. I shall conclude with a brief remark about the other side of the doctrine of Torah from heaven: Torah to earth; in other words, what it means to receive it from heaven. Earlier, I mentioned that Jacobs draws a parallel with hamotzi, the blessing over bread, which God ‘brings forth from the earth’. But I prefer a parallel with manna, the mysterious substance that sustained the Israelites in their wanderings through the wilderness, the food that fell from the skies. Manna was from heaven but the people had to gather it. The difference being that with the Torah there is no end to gathering its meaning. This, when you stop to think about it, is part of the weight of the doctrine of Torah min HaShamayim. (Words from heaven never settle on the page.) Which is why no thoughtful believer – no one who embraces the ‘traditional picture’ in all its majesty – could possibly be a fundamentalist. Tamar Ross is developing a theory of revelation in which she wants to maintain the full drama of Torah life with its total devotion to living the Torah life yet at the same time to allow for the possibility of accepting the findings of Biblical criticism. We have been working on this interview since January. Her approach uses an internal dialogue with other positions so neither the questions nor the answers in this post reflect my thinking in any way. Ross’s theory is developed through her rejection of what she sees as a widespread but inadequate solution. The rejected solution is to live with consciousness of the fall from naiveté, continuing to live as if the Torah and Torah from Sinai are true, without any change in the conception of God and revelation. Ross finds the self-aware “as if” solution problematic, because such self -consciousness may cool our devotion and commitment. Secondly, we are living the falsehood of maintaining an inadequate and wholly supernatural metaphysics. Ross’s solution is an understanding of revelation that blurs the line between God and human input, or the natural and the supernatural. If we accept the allegorical interpretation of tzimzum as a paradigm, as presented in works like Rabbi Hayyim of Volozhin’s Nefesh Hahayim and the writings of R. Shneur Zalman of Ladi, God is from His perspective (mitzido) an all-embracing monolithic unity. Hence revelation as an act of communication between two entities is, for Ross, entirely from our perspective (mizidanu). She is attracted to Rav Kook’s model of God and creation that strives to meld the two perspectives by suggesting that from our point of view, God without creation, lacks the virtue of lack, which allows for dynamism, free will and the striving for perfection; He therefore requires creation and its upward striving in order to add the virtue of perfectibility (Hishtalmut) to the quality of perfection. This is the basis for Rav Kook’s interest in the evolution of human understanding and the universe at large as progressing to ever more sublime divine heights. What is your approach to resolving the issues raised by Biblical Criticism? I contend that it is still possible to maintain belief in the divinity of the Torah despite the modern critiques by breaking down the strict dichotomy between divine speech and natural historic process. This task is facilitated by re-appropriating three assumptions that already have their basis in tradition. The first assumption I draw upon is that if the Torah is to bear a message for all generations, its revelation must be a cumulative process: a dynamic unfolding that reveals its ultimate significance only through time. The second assumption is that God’s message is not expressed through the reverberation of vocal chords (not His, nor those of a “created voice” as some medieval commentators suggested in order to avoid the problem of anthropomorphic visions of God), but rather through the rabbinical interpretation of the texts, which may or may not be accompanied by an evolution in human understanding, and through the mouthpiece of history, a form of ongoing revelation. The third assumption (supported by contemporary hermeneutic theory) is that although successive hearings of God’s Torah sometimes appear to contradict His original message, that message is never totally replaced, because on a formal level the original Sinaitic revelation always remains the primary cultural-linguistic filter through which these new deviations are received and understood. By blurring distinctions between the natural and the supernatural, the finite and the infinite, I contended that it is possible to relate to the Torah as a divine document without being bound to untenable notions regarding the nature of God and His methods of communication, or denying the role of human involvement and of historical process. Such an understanding allows the religiously committed to understand that the Torah can be totally human and totally divine at one and the same time. The upshot is a process theology which allows for an ever evolving human view of the Divine. This approach, according to Ross, need not cool religious passion because there is no bifurcation of secular and religious understandings of the Torah. All striving for perfection is part of the unfolding of God’s will. In addition, since human activity is God’s instrument then there is no need for problematic supernatural metaphysics. 1] What should I do after learning about Biblical Criticism? Biblical criticism forces us to evolve and understand revelation in a more nuanced fashion. We don’t necessarily negate biblical criticism but neither do we substitute it for Talmud Torah. We continue teaching Torah in the traditional manner but with a greater appreciation for its open-ended character, in accordance with a more refined understanding of revelation. 2] What is this refined understanding of revelation? Accepting a natural sense of God and revelation. God is not merely transcendent but also immanent in the interpretive responses of humanity. 3] Isn’t this subjective? No, because it rejects the sharp distinction between God and human perception, between mitzideinu and mitzido. 5] How can we still accept a metaphysical God? How can we still have metaphysics after the naturalistic critiques? By blurring the line between God and the universe and understanding the term “God” as ultimately striving to capture that monolithic unity which is beyond definition. 6] How is this better than the liberal supernaturalism of Louis Jacobs? Jacobs may well have been groping towards a theology of the sort I am suggesting. In the epilogue to his 4th edition of We have Reason to Believe he contends that people have been mistaken when they understood him as suggesting that we can naively mark some passages in the Torah as divine and others as human. Nevertheless he did regard some passages as more noble than others, so that he did not see all as equally binding. My approach accepts the Torah in its entirety as the expression of God’s unfolding in history, and revelation as immanent in human activity. Even passages in the Torah which appear problematic to us today, and the historical context which triggers our discontent and moves us to seek new interpretations, are part of that process. 7] If the Torah was not given in the traditional way, then why choose Torah over Shakespeare or Buddhism? This is the cultural-linguistic system into which we were born and were educated. In light of its remarkable spiritual legacy and resilience, we view it as offering a compelling prescription for life, ethics, and recognition of a spiritual dimension of reality beyond the everyday. 8] Isn’t your approach close to Spinoza with an immanent deity and a naturalistic revelation? Yes, in some respects. But it allows me to still maintain the value of a theistic perception as an indispensable “chamber and reception hall” (as R. Kook puts it) to Spinoza’s vision of ultimate unity, along with the traditional understanding of Torah practice and study based on the halakhic model of avodat Hashem. 9] What is the role of history as a process? God from His perspective (mitzido) is an eternal undifferentiated unity, but from our perspective (mitzidenu) He unfolds immanently in time through historical development and human agency. The world is evolutionary and embellishes upon God’s infinity in the never-ending unfolding of a more intricate and particularized reality. 10] What do you think of the various non-foundational solutions for the problem of revelation including treating it as myth or treating the text “as if” true, or Wittgenstein’s linguistic understanding of religious belief? Treating the traditional account of biblical revelation as a foundational myth can justly be taken as the apologetic of all apologetics, a type of meta-solution broad enough to cover even the most general and all-pervasive critique regarding the “truth” of Jewish dogma. Since the function of myths is not strictly cognitive, but rather to create a more elusive sensibility or way of relating to the world, it is far more important to live your life “as if” they are true than to uphold their propositional content. However, people adopting the “myth” approach have generally also been associated with the approach of liberal-supernatural theology (the Torah is part human and part divine) and so they tend to see this solution as a license for picking and choosing which elements to take and which to reject. 11] Instead of the misleading undertone of myth as something possibly false, you propose that assertion of faith is commitment to a particular language game. What do you mean by this? The process of converting an unbeliever into a believer on this view resembles the teaching of a language, not because religion itself is a language, but because it functions as one, in helping us internalize views and acquire skills which have already been formulated and developed by others. When we acquire the knack for its conceptual syntax, we begin to intuitively know how to use its symbols in a manner that suits its internal logic. The final product of the religious learning process is not meant to be an authoritative list of religious dogmas or an ideal moral system, but rather implied or suggestive directives as to how to think about God and to conduct one’s life in accordance with these thoughts. In a best case scenario, cultural-linguistic directives become second nature, and fulfill an essential role in fashioning the life of the believer. The purpose of religious discourse is not substantive (referring to a particular truth) but rather constitutive or regulative – offering us an entire universe of discourse, within which to live the life of faith. Wittgenstein’s basic premise at his later linguistic stage was to regard all linguistic statements as acquiring meaning only by virtue of their use in a particular context. To illustrate the diversity of contextual discourse, Wittgenstein introduced the concepts of “language games” and “forms of life”. The different functions or substructures of language comprise different “language games” – i.e., goal-directed social activities for which words are just so many tools to get things done in accordance with the “grammar” of their distinctive context. Each language game does a particular job, conveying certain meanings to those who participate in its particular discourse. Justification is internal to the activity or “form of life” concerned. 12] Why is this useful? A cultural-linguistic approach to religious discourse seems particularly suitable for modern Orthodox sensibilities because of the rare mix of intellectual liberty and fidelity to tradition that it supports, allowing us to absorb and combine various and even opposing points of view. It tones down the idea that religion must correspond to some predefined external foundational truth, which exists “out there.” Therefore, we can reject the notion of biblical inerrancy (i.e., that Scripture is completely accurate in all matters of history and science) because the bible is not about external truth. Even in matters of faith and practice, the rationality and relevance or “truth” of religious tradition is maintained not by appeal to external evidence, but rather by skillfully using the internal grammar of religious discourse to provide an intelligible interpretation on its own terms. As against this, however, subscribers to this approach appear almost reactionary and fundamentalist in their absolute commitment to abide by the constitutive guidelines of their religious tradition and to submit to its internal authority. In this they differ from those who feel that abandoning a fundamentalist understanding to religious truth claims leaves room for selectivity. 13] Doesn’t deliberate assumption of religion as a language game nevertheless interfere with “simple belief”? The self-aware cultural-linguist can travel hand in hand with the naïve realist of simple belief for a very long way in preserving the psychological force of his religious commitments. So long as they are both functioning within the religious language-game itself and abide by its guidelines, the two will not differ radically for all practical purposes. The only difference between them will be the former’s consciousness of the fact that the basis for these adjustments stems from internal “form of life” rather than external truth claim considerations. This allows him to view his attempts at reconciling religious truth claims with a hypothetical objective “reality” more ironically, and to entertain the possibility that these may eventually be replaced by another more illuminating picture. 14] How does this approach help the blogger whom you cite in your extended paper who treats the service as theater? (Modern Orthoprax – July 2009, “Religion…is Tony and Tina’s wedding writ large…. If only I could forget about that damn camera man”). Won’t he just say that your approach to belief is heterodox and not a true Yeshivish belief in Torah min Hashamayim, hence you are orthoprax? I admit that when the “as if” quality of religious belief, or its understanding as a language game supporting a particular form of life, is adopted consciously and deliberately as a blanket response to new loss of innocence, rather than as an internal solution to localized problems, conducting one’s day to day living in accordance with its guidelines could be more problematic. Someone who says he accepts Biblical criticism but lives “as if” the Torah is true simply because this is the grammar of his religious language game still experiences the conflict of two different perspectives – inside the system and outside criticizing the system. My interest is in developing a rationale that can accommodate both. This is where the contribution of modern kabbalah and its unique amalgam of realism and non-realism comes in. Meaning: that God and the world are real enough from our perspective and at the same time the world is not real, in the sense of a separate existence, from God’s perspective. In an ultimate sense, both the world and God are not real, since on that level the very distinction between the two, or between existence and non-existence is obliterated. Were R. Hayim of Volozhin, R. Shneur Zalman of Ladi, R. Dessler or R. Kook not true believers? The divide is not between Yeshivish and non-Yeshivish, but between those who are inclined to reflect philosophically regarding the nature of their religious beliefs and those who are not. 15] Your appeal to the linguistic approach and your view of breaking down the dichotomy of human and divine speech are two positions that can be separated. Why are they connected in your mind? Breaking down the dichotomy between human and divine speech is a response to the challenges that ubiquitous human imprints and the attribution of speech to God in the literal, verbal sense, pose to the notion of a divinely authored text. Although a cultural-linguistic approach to religious belief allows us to relate to doctrine in an “as if” manner, this does not preclude the urge to make religious belief (especially its most basic tenets) rationally intelligible. This activity is part and parcel of the religious language game itself. 16] How is this different than the position of James Kugel? Firstly – Kugel, despite his emphasis on the interpretive process which converted the bible into Scripture, still seeks to ground the authority of the Torah – at least minimally – on some objective event at Sinai. As far as I am concerned, this may have been, but I do not find it necessary. Secondly, Kugel finds it essential to believe that the core message of that event (the command/s to serve God), no matter how it was transmitted, originated in some intentional movement on God’s part which somehow got filtered down to us in words. My view of God’s “speech” is rather as illocutionary acts that trigger humans to “hear” a message, and identify this as divine revelation. The Torah surely records accounts of people believing that they had revelatory experiences, but its ultimate authority is grounded on the form of life that developed in the wake of such experiences and the strength of its grip upon us. Thirdly, Kugel sees the basic message of the Torah as saying that the way to come close to God is by “becoming His employees” and serving Him in daily life. I agree that this is the primary message of the Torah as subsequently interpreted, but my evolutionary understanding of Torah does not limit connection to God exclusively to this model. 17] What if someone does not accept kabbalah as their way to understand Torah, especially if they are not comfortable with the allegorical interpretation of Luria? The importance of the allegorical interpretation, particularly on R. Kook’s understanding, is simply in offering a multi-layered view of God and revelation. It allows us to maintain a continuum between immanence and transcendence, subjective and objective, natural and supernatural while preserving some distinction between them, and to also allow for an ultimate reality where all such distinctions are dissolved. One does not have to be bound by kabbalistic terminology and symbolism in order to accept this basic message. Reread my rules for comments before commenting. As of this week, I return to regular blogging. I thank everyone who contacted me wondering where I was. A few points before we resume our regularly scheduled programming. 1] Due to recent events, comments will no longer be allowed from an unknown email or IP addresses. You can remain with an anonymous screen name such as EJ or IH, but you need a verifiable email and IP addresses corresponding to a person known on the web. No more malinator email accounts and no phony emails. I will not place an ID program on the blog. Just give me an email that I can google to verify with a matching IP. (I understand if you have a separate IP for home and work.) If you need to explain yourself, then do it in the line for URL. I already have a stable IP address and email for many of you but for those whom I don’t, you will need to start using one. Don’t take it personally. 2] It appears that the majority of my readers are not reading the posts in real time. They are noting the articles that they want to return to read and then returning on the weekend or in later weeks. People use Pocket (nee Read It Later) and other programs to mark the article to return to read. I get spikes on a post two weeks after posting. Hence, comments are no indication of number of people reading a post. It also means that people like longer posts so they can treat them as magazine articles. 3] I would like guest bloggers to fill in some of my time away. If anyone is interested and has material appropriate to this blog, then let me know.